In this segment, Bill and I will be discussing why there's a better chance of a Psalm 83-type war happening before the Ezekiel 38-39 Gog-Magog Battle between Iran and Israel. Bill Salus: A lot of people have sort of an "Ezekiel 38-39 fervor" going on right now, and rightfully so. Nathan Jones: Like you've been saying in Isralestine, though, the nations that comprise Ezekiel 38-39 do not border Israel. If we look at the modern names of the nations listed in Ezekiel 38-39, we easily see this absence. The players are Rosh, which is Russia, the ancient Scythian people. Turkey is listed, as well as Armenia. Turkey just signed a pact with Armenia recently. Lybia is on the list, as well as the Sudan and all these lesser nation. Persia is now called Iran. All of the Ezekiel 38-39 nations form an outer ring around Israel. One day they will plan on getting together to attack Israel, prompted by God Himself. Ezekiel 38-39 says God will put hooks in the leader of this coalition — a leader who will be designated "Gog" — and drag them down to their destruction. But, we look around the nations surrounding Israel like Egypt, Lebanon and Syria and Jordan, and we've got to wonder why they are sitting the Gog-Magog invasion out? Hezbollah has 40,000 rockets now pointed south from Lebanon at Israel. So, these are definitely countries that hate Israel with a passion and who everyday are yelling they want to destroy Israel, and yet they are sitting out the Ezekiel 38-39 invasion. I agree that it is certainly worth exploring and thinking about why they aren't listed in the Ezekiel 38-39 Gog-Magog invasion. Is it because Israel deals with them prior in the Psalm 83 episode. Of course, that is the central theme of Israelistine. 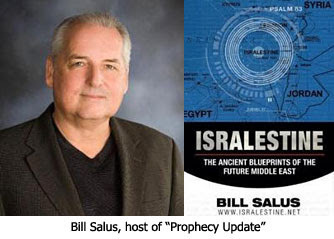 Bill Salus: Dare we talk about how close some explosive events in the Middle East could be? Unlike my mentor Dr. Arnold Fruchtenbaum who likes to have a "wait and see attitude" and not speculate, occasionally I go out on the fringe and speculate just a little bit. So, I am going to do that a little bit. Nathan Jones: Too true. Iran has already threatened to close down the Strait of Hormuz where 40 percent of our oil travels through. So, it's not like this is something far out in the Middle East that no one in the West has to worry about. A big Middle Eastern war will affect the entire world. Going on to the Gog-Magog Battle of Ezekiel 38-39, there will be some tremendous fallout from that. The world finally acknowledges God. There won't be an atheist left after Ezekiel 38-39! God is going to destroy those invading armies miraculously. We are talking about hail and fire and the armies turning on each other. Along with the supernatural destruction of the invading armies in the "mountains of Israel, Ezekiel 39:6 says there will also be fire falling on the invading nations' homelands, those nations that feel they are in safety. Whatever Ezekiel 38-39 results in, it results will also be felt worldwide. I don't believe Christians will witness the battle of Ezekiel 38-39. It is more related to the Tribulation because the nations of the Earth end up acknowledging God. That revelation is a very Tribulation type of event. But, I think we could be here to witness a Psalm 83 War. Israel right now really has no friends. They are surrounded by hostile enemies. We have Iran which nobody is doing anything serious about, and certainly the United States isn't. The European Union is trying to divide up Jerusalem. Israel has to do something now about the Iranian nuclear threat. One of Israel's generals came out recently and said that the next war Israel has to face will be an all-country war because the enemy missiles now can finally hit any part of Israel. Fortunately, the Israeli Defense Forces are very smart and they know how to fight. I think they will have to do something about their surrounding neighbors. Maybe a Psalm 83 war will be enough to push Iran and these other outer ring nations to back up a little while and catch their breath before they make an Ezekiel 38-39 coalition and attack. Bill Salus: Right. The Walls Street Journal came out I think it was in October or November of '09 and reported that should Israel plan a strike on Iran, Iran will follow through with their threat to shut down the Strait of Hormuz causing the price of oil to go up to possibly $300 a barrel. Presently oil is closing in around $70-$80 a barrel. Hartdawg, just my opinion here: I suspect that gas prices will go sky high; HOWEVER, perhaps it will cause us to become more dependent on our own resources. Recently, there have been large oil deposits found in parts of Texas, off the Gulf of Mexico, in Pennsylvania, and in other areas of the U.S. I've also read about new discoveries that show we are not running out of oil--we just need to utilize what we have. In addition, I've read of several companies harvesting all kinds of plants (from mesquite trees to a plant in S. America) to replace oil. If it becomes more difficult to acquire oil, my suspicion is we will do what we've always done--use our ingenuity and creativity to find viable solutions. I have been looking out for opportunity to 'talk' to you. I don't think I have disagreed with you once all the time I have been reading this blog. I was wondering if my ramblings had scared you off - couldn't blame you, I scare myself at times. Glad you are back. I think my mind is in the same place as yours. I know I shouldn't worry but I do. I know I should be patient but I'm not. I know I should be hopeful but I...wait...I AM hopeful because I think we WILL be checking out of this situation soon. That's what the Rapture give us above all - hope. As far as fear of what is coming in the Middle East - I'm more worried about what is coming in the Eastern United States. Between trillion dollar deficits, unemployment, bail outs, government takeovers and especially terrorist symapthetic policies, I think the U.S. is mostly in danger from within. Hartdawg and Billy, you may be right, but I wasn't thinking of the government coming up with good ideas. I was thinking more of business-minded people who will capitalize on a golden opportunity. Of course, that's not to say that the government won't squelch their solutions, but historically we have had a way of getting around the obstacles--even big government. I, too, am looking forward to the rapture. Perhaps too much--since I really should be looking for a job these days rather than reading articles and listening to online sermons! Sigh! I've ALWAYS felt Obama is a closet Muslim - this doesn't ease my suspicions. It occurs in "the latter years" ('achariyth shaneh - meaning the after part division of time) but prior to Daniel's 70th Week for Daniel was told nothing of this by the angel Gabriel. I have always thought the Church may see this war, simply because of the 7 year time scale required to bury bodies and burn weaponry. Somehow it doesn't feel right that Israel will concern herself with cleansing the land throughout the Tribulation - other things to worry about?